You may have seen similar, single head versions at a local hardware, auto, or home store, but this model trumps all others which is why we carry it, and why it is simply good. Dual rotating spray heads deliver more cleaning power by covering a larger surface, and will allow you to do more in less time. 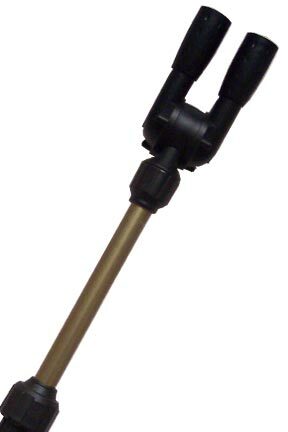 With almost double the power of the single nozzle versions, this long reach spray wand will allow you to clean and water anything, no matter how high, or out of reach it is. When set to full blast, The Ultimate Water Blaster will power through dirt and debris in order to clear gutters, wash driveways, or spray off vehicles. Use the integrated thumb lever to turn down the flow for more delicate jobs like watering hanging plants or filling bird baths and fountains. Since the double head is able to fully rotate all the way around, you not only get a super long handle, you also gain the ability to aim water in any direction you need. 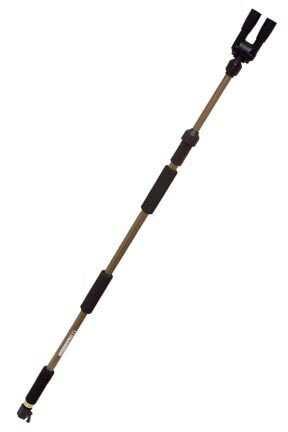 This tool produces a powerful spray, which makes it extremely useful for yard maintenance and other cleaning jobs around your property. It hooks up to a standard garden hose, and is surprisingly lightweight, so anyone can use it. Clean your gutters, spray down pathways, sidewalks and driveways, or simply use it water your plants. The extendable pole and powerful spray heads that can adjust to any angle will ensure that no job is impossible, and no object is out of reach. 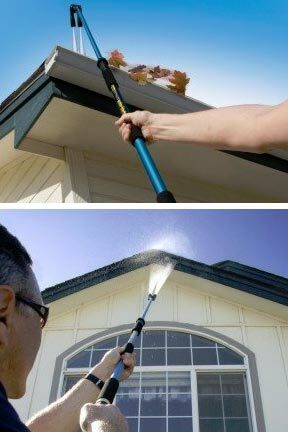 Because you can aim the nozzle in a downward direction, this wand will allow you to clean clogged gutters and downspouts in just minutes without ever taking out a ladder or step stool. If you have a large vehicle, boat or RV, you will love the Ultimate Water Blaster. It makes it easy to hand wash large vehicles, and will increase speed and effectiveness too. No stretching, straining or ladders are necessary to rinse high roofs or reach under and around your boat, truck or van. Use it in the back yard for patios, furniture and decks because it can easily clean everything to get you ready for the season, or keep stuff clean all summer long. Bring it around to every side of your house to power grime of vinyl siding, remove debris from window screens and doors, or clean your outside windows. Got a utility trailer, lawn tractor or other equipment? Then use the Ultimate Water Blaster to quickly spray clean after use, and keep them looking good without wasting effort. It is not a pressure washer, but it will increase the pressure of your water. The double nozzle will force water out in a powerful and accurate fan-like pattern that will wash and remove stubborn debris, and give you the power you need to clean almost any mess. Thanks to the fact that there are two heads instead of one, you will be able to cover more surface area in order to clean with less effort and in a shorter amount of time. When collapsed the wand is already pretty long at about 38", but use the simple telescoping action, and you can extend it to a full six feet. Sturdy anodized aluminum construction ensures a tough tool that will last for years, but also makes it lightweight and easy to hold for long periods of time. Three soft and squishy grips increase comfort, and allow you to handle it differently depending upon current length, the job you are doing, and who is using it. The dual nozzles on the water blaster are made of metal, but they are encased in sturdy rubber to add durability and protect any surface you are cleaning. Due to this design, there is no way for you to scrape or scratch accidentally. The heads are able to spin all the way around, and will click into position, so once you set them to a certain angle, they will remain there until you adjust them again. An integrated thumb control allows you to adjust water pressure on the fly without going back to the spigot, so you can clean the eves of your house one moment, and then switch right over and deliver a gentle stream to that plant way back in your garden. 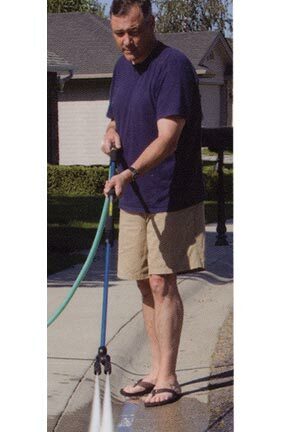 Year after year, and all day long, the Ultimate Water Blaster will deliver tons of cleaning and watering power, while remaining easy and comfortable to use. Order Yours Today! Dimensions 1.25" x 2.75" x 40.5"
Ultimate Water Blaster - A high quality outdoor tool that allows you to reach just about anything to spray it with water. Adjust the spray from low to high to switch from watering flowers to washing your driveway. Deliver a powerful blast, or just a trickle. Order Yours Today! Like it, it works, but very disappointed in the blast....it does not remove grime off of the sidewalk like advertised on tv....but, its good for hoses things down, that are lightly built on, like mud, but however it did not remove the stains from the mud and dirt...the blast is not powerful enough! great for car ( suv ) washing. The double nozzle version is better than the single. Just one big caution, put it down carefully, the wall thickness at the nozzle joint is very thin and cannot withstand a slight drop to the ground. Yes. We do ship to your country. To get an accurate quote prior to checkout, just add to cart, and then use the calculator there. After you enter your general location, it will give exact rates for the different methods available. Exact spray distance will depend on input water pressure and volume. A Super Absorbent Sponge Block. Lumbar Back Support for Improved Posture & Pain Relief. Prevent & Relieve Neck Pain. Super Comfortable, Mesh Neck Support.